"For most of 1911, ... Villa was taken up with his private life and love affairs. This was the year he married Luz Corral, a woman he had first met in November 1910. She was a simple girl who lived with her mother in straitened circumstances in the old military colony village of San Andrés. Like all households, the Corrals were asked for a 'voluntary contribution' to the revolutionaries' war chest when they rose against Díaz. In despair Luz's mother went to Villa and explained her crushing poverty. Villa was sympathetic, went to the house to see for himself and agreed that the 'tax' should be a nominal amount of coffee, corn and tobacco. While there he saw Luz and liked what he saw; he came next day and asked Luz to marry him. Between being the wife of a guerrilla leader and eking out a living in crushing poverty it was no contest, so she agreed. Her mother, however, did not take the same benign view of this development but, not daring to oppose Villa openly, suggested that Luz make him a shirt. She knew of her daughter's non-existent calibre as a seamstress and hoped that Villa would become disillusioned when he saw Luz's domestic incompetence. 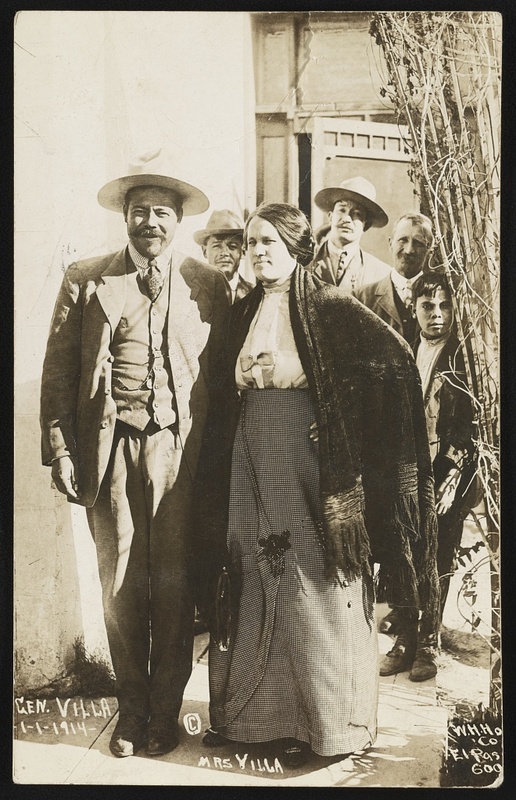 She scarcely knew her man: unlike [his revolutionary counterpart Emiliano] Zapata, Villa was careless about what he wore and would certainly not have allowed a shirt to come between him and his sexual desire. "The naive Luz Corral seems at first to have imagined she was marrying Villa on the same basis that Josefa Espejo had married Zapata in Morelos. The ceremony, in a Catholic church, may have bamboozled her, but even then she must surely have had her doubts when Villa, asked by the priest if he wanted to be confessed before the ceremony, replied that it would take too long. There must be doubts about whether Villa was ever married in any full legal sense, and the marriage to Luz Corral had no more validity than Villa's earlier espousal to Petra Espinoza in Parral. Additionally, Villa already had maybe a dozen women all over Mexico to whom he had either promised marriage or with whom he had gone through some kind of ceremony. Villa took the pragmatic line that liaisons with women were all about the satisfaction of carnal appetites, and that if women were stupid enough to want a meaningless ceremony of wedlock, he would not disappoint them. However, Villa was aware that the law formally forbade polygamy so, although he 'married' dozens of women in the presence of priests or civil officials, once the liaison was consummated, he would have his men destroy all relevant marriage records and copies. In Norse mythology the goats slain in Valhalla by the warriors for their feasts were always alive again the next morning. In a similar way, Villa emerged from every honeymoon a bachelor. "Both Zapata and Villa were in effect serial polygamists. This would not have occasioned the shock in turn-of-the-century Mexico which it does in our politically correct age, but then the entire male population of Mexico would have been regarded as 'misogynistic' by the standards of the twenty-first century. Villa believed in ritual courtship, compliments or piropos, gallantry and chivalric behaviour. Although he abducted women, he never raped them but waited for them to give their love freely; of course, because of the circumstances in which they found themselves, many of Villa's women acted under duress. ... Soledad Seañez, one of the last of his 'wives' and certainly one of the most beautiful, testified that in private life Villa was as volatile as in public, terrible when in a rage, but tender and loving when in a good mood."